Thanks for a record month! Normally, Summer is the slow time for local politics. Fewer public meetings and fewer big decisions lead to fewer good stories. Typically, the budget gets wrapped up in early June, and that's about it. Not this year though. June turned out to be the all time best month for aShortChronicle. June set a record in monthly page views and also contained the best all time week and best all time day of the last 4 1/2 years. June bested the previous monthly record of page views by a whopping 33%. The previous record was set last November in the runup to the municipal elections. What's interesting about these numbers is that even when removing the record day, it still would have been a record month by a significant double-digit percentage margin (15%). Said another way, the record month was not solely driven by this outlier, but instead was driven by increased average daily readership. That's something that bodes well for the future. Thanks go out to all of you who read, provide tips and backgrpund information, and share the stories here at aShortChronicle. Sometimes these stories rub people the wrong way, something evidenced by the pushback some of them receive. However, by comparison the overwhelmingly positive feedback makes dealing with the naysayers all worthwhile. Thanks again! Your support is greatly appreciated! Commissioner Brian Jenest's firm is on a roll in Davidson. Yesterday, David Boraks broke the story on a new neighborhood of 99 units on South Street involving Jenest's firm. While this neighborhood is technically in Cornelius, it is on the Davidson side of the covered bridge connecting to Antiquity and feels like it's in Davidson proper. Now comes notice via the Town of Davidson website that another ColeJenest&Stone designed neighborhood is in the works at the other end of town. "The Washam neighborhood is located on the south side of June Washam Road. The proposed development includes property located within the Neighborhood Edge and Rural planning areas. 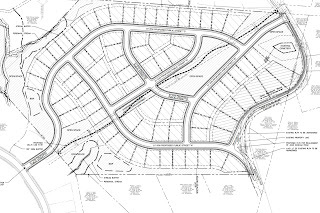 As proposed, the +/-52 acre Washam neighborhood would feature 80 housing units with +/- 20.6 acres of open space, yielding 1.6 units per acre with 40% open space." 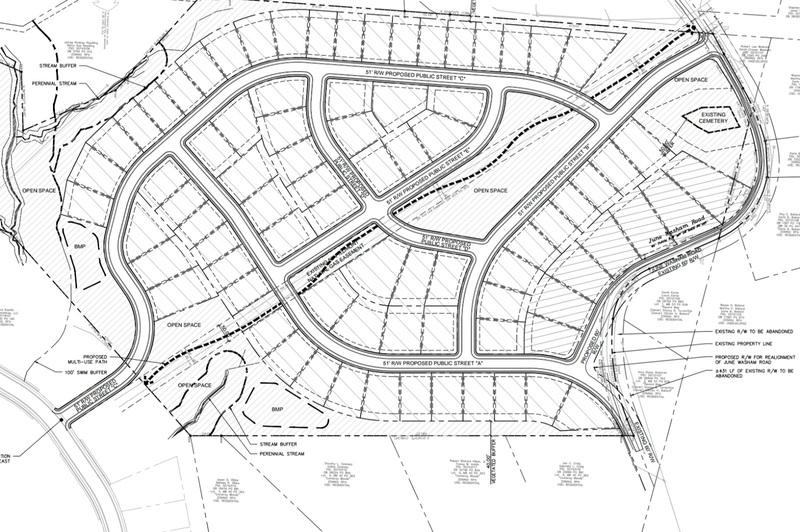 "NVR-Ryan homes 'the Applicant' intends to develop the 52± acre site for a detached, single-family residential community. 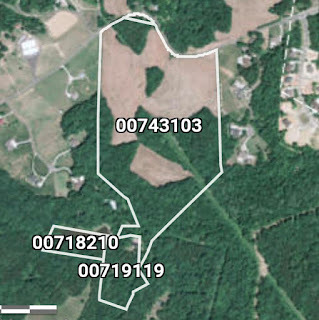 In conjunction with this development, the Applicant is coordinating with the North Carolina Department of Transportation and The Town of Davidson regarding the realignment of a portion of June Washam Road in order to provide additional traffic calming measures to support safer mobility in the area." The highlighted comment about realignment is interesting. During the June Davidson Board meeting the possibility of the Town taking over June Washam from the State was mentioned by one of the citizen speakers. It was given as an example of the town being willing to take over roads to support development. There was pushback from the dais from Commissioners Graham and Anderson indicating Commissioners were unaware of that possibility. A March 25th email available via public records between ColeJenest&Stone, the developer, NCDOT and Town Staff indicates taking over June Washam as a topic of conversation. What becomes of that and the "coordinating" efforts between the town, NCDOT and the developer remains to be seen. However one thing would seem to be clear. Town commissioners may want to take a more active role in keeping track of development conversations that could lead to requests to put the town on the hook. Stories broken at aShortChronicle a year ago appear to have resonated with the Roy Cooper Campaign. Last Summer, aShortChronicle broke the story regarding connections between Cintra, the NCGOP, and the McCrory Campaign in posts here and here. These posts are both top five of all posts at aShortChronicle. During the debate last Friday after McCrory danced and deflected a question regarding the I77 Toll project, Cooper answered directly saying the contract with Cintra should be cancelled. Then he zinged McCrory for the very connections outlined in those posts. Cooper says "Governor McCrory's campaign staff was hired by this company" - meaning Cintra. If you listen closely you can hear an uncomfortable chuckle come from McCrory immediately after that line. Check out the exchange starting at the 23:30 mark of this video from Charlotte's ABC11 affiliate. We here at aShortChronicle wouldn't be presumptuous enough to think the Cooper campaign wouldn't have known about these connections otherwise. Finding out this stuff is Opposition Research 101 for any big time political campaign. However, it is an example how the blogosphere can be well ahead of the mainstream media on what might eventually be important stories. It could be telling that the Cooper Campaign threw this punch right off the bat in the first debate. Did that happen only because the debate was in Charlotte? Or, do they plan to make a bigger issue of this in the campaign? Only time will tell, but remember you heard it here first. 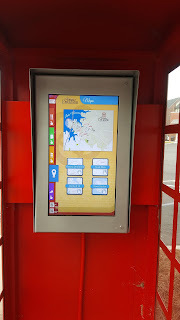 $25,000 Info Kiosks in #Davidson...your money at work. 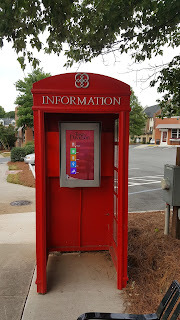 Just in time for the Brexit, the London-esque red phone booths on Davidson's Main Street finally have spung to life. 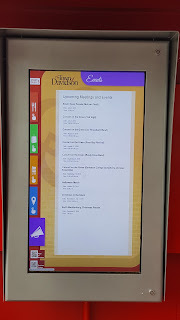 Davidson budgeted $24,727 in the recently ended fiscal year for the booths, software and touchscreens. 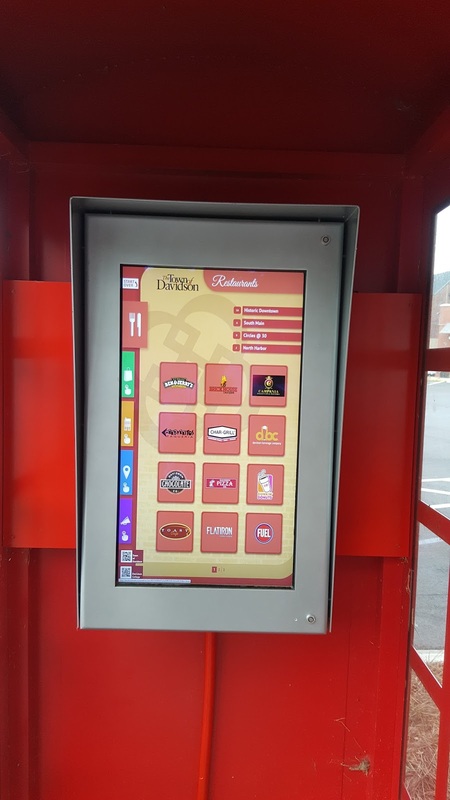 Next time you hear complaining about not having enough money to spend on the actually important things in town, you might mention this one. Doesn't just about everyone have a smart phone in their pocket these days with this info? There’s a reason for the saying “you can’t fight city hall”. It’s hard! To get what they want citizens need perseverance, organization, and a willingness to push. The recent successful effort to lower speed limits on Davidson-Concord Road provides a prime example. To be fair, local residents weren’t so much “fighting town hall” in this case as the Town of Davidson had previously asked to have the speed limit lowered. The problem was that when NCDOT said “no” on each occasion, the town did not force the issue. The situation came to a head this Spring when multiple videos surface showing harrowing scenes near a school bus stop in the area and as the new West Branch neighborhood proposed over 300 new residences on the Westmoreland Farm adjacent to the already dangerous Robert-Walker Drive intersection. So, what did residents do? In the interest of transparency, I was involved in some of the activities that follow,, but all of the heavy lifting was done by many other citizens. Residents organized multiple trips to town hall leading to two packed meetings in May and June. They worked with the media to bring the issue more attention. They showed tremendous courage in speaking truth to power. Most importantly, they did public records requests. In this case it, these requests showed many interesting things. Here are just a couple. The public record showed on multiple occasions in 2013 and 2014, citizens asked the town how they could get involved. Should they go to their legislative representatives? Could they help with gathering petitions? In at least three different situations during this time period, Mayor John Woods told different residents that if NCDOT did not agree to lower the speeds, the town would engage the citizens for these activities. That never happened. In another thread, the record shows NCDOT actually being open to the idea of lower speeds around Robert-Walker Drive contingent on the installation of a roundabout. However, the discussion was related to the proposed West Branch development and on street parking – not as a pedestrian safety initiative. This conversation involved NCDOT and the developers, including Commissioner Brian Jenest whose firm is doing the project’s design. Somehow, that information did not make it to the town board as a whole for nearly three months? The answers as to “why” are not in the public record, but it does show the mounting pressure having an impact. That contact to state electeds appears to have been the turning point. After the May 10th town hall meeting, Bradford again posted to Facebook saying he was coordinating with the State Engineer at NCDOT to have a closer look at the issue. Shortly thereafter, State Engineer Kevin Lacy spent a Sunday and Monday in the area, and before the June 14th meeting the decision was made to lower the speeds along the entire length of the road including the area at Robert-Walker - without a roundabout. Still though, the activists work wasn’t done. NCDOT had made the speed reduction to 35mph by Robert-Walker contingent on the West Branch development being 25% occupied – potentially delaying it many months, if not years. It took another trip to town hall and another round of impassioned speeches to NCDOT Rep Scott Cole who was in attendance to get the speed limit lowered immediately. As of last Thursday, the new speed limit signs are up. Should it have been this hard? No, it shouldn’t have. In the end however, it yielded the results citizens were seeking - making it all worth it. A ghost(writer) in Davidson Town Hall!?!? 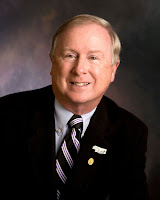 This week's edition of the Lake Norman Citizen features a piece on last week's Davidson Town Board meeting where Commissioners addressed Mayor John Woods's June 8th trip to Raleigh to meet with Senator Berger regarding the recently deceased HB954. While The Citizen depicted the Board's comments as a harsh rebuke of the Mayor's actions, but the Board's actions could be more accurately described as a slap on the wrist. A good bit of the article was devoted to a transcript of the Mayor's statement attempting to explain himself. A little digging would have shown the whole exchange for the kabuki theater it actually was. Fortunately for readers, aShortChronicle has done that digging. A public records request was done on the subject meeting and the results - as usual - show there is more to the story. It may come as a surprise (or not) that Mayor Woods's speech was not entirely his own words. He engaged a ghost writer for a little fancy wordsmithery. According to the records request, on or about June 12th Woods engaged a local firm called "A Way With Words" - run by long-time former Commissioner Margot Williams - to spice up his presentation. Williams served as a Davidson Commissioner from 1995 to 2011. In 2007, she along with Woods voted unanimously with the rest of the Board at the time to form Mi-Connection, so it's maybe not all that surprising to see her helping him with the current hot topic of the I77 HOT lanes. The wording of the draft speech was so that Woods could own his "authority as mayor". To that Woods responded "Excellent! Thank you!" The draft included these lines. "I voiced my own opinions, based on hundreds of interactions with citizens and law enforcement, on the need to improve traffic congestion in our region. 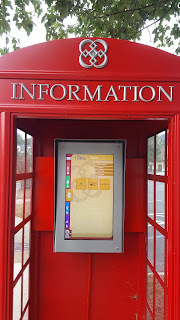 As mayor I am accessible in town and constantly approached by citizens about the current crisis, placing me in a unique position to gather information and concerns on a daily basis." While Woods spared citizens those lines in his town hall speech, he did use them in at least one response to a supporter per the public record. While Woods clings to the position throughout his comments that he was only expressing his opinion and not acting as "mayor", these missing lines from his comments at the town board meeting show that his opinion was formed precisely because of his position as mayor. His response of "Excellent!" to the idea that the wordsmithery was done to "subtly" have him own his "authority as mayor" also belies the true situation. It's hard to believe that a ghost writer was needed for small town politics. It's really a sad statement on current affairs. What's next - a TelePrompTer at Town Hall?? However, there is a lesson in it. Remember to not always believe what you hear. There might be a ghost in the room. Tuesday, the other shoe finally dropped on the latest best chance at stopping the I77 HOT lanes project. The NC Senate Republicans met in caucus and decided to not advance HB954 which had passed overwhelmingly in the House. Soon after the closed door meeting, Kurt Naas posted this to the Exit 28 Ridiculousness group on Facebook. Last week when it became clear the fate of this bill would be decided this way, Naas told me he wasn't sure what to think about the delay in the caucus meeting to this week. To that I responded that maybe, just maybe, the Senate was hoping to run out the clock on the session and pass this bill just before it ended. That would have given Governor McCrory the face saving opportunity to let the bill become law without his signature. "The governor must sign or veto legislation within 10 days after transmittal, or it becomes law without his/her signature. If the legislature adjourns for more than 30 days, the governor must act within 30 days after adjournment, or the legislation becomes law without being signed. If the governor vetoes legislation after adjournment, he/she must reconvene the session or the legislation becomes law despite the veto on the 40th day after session adjournment." To that Naas said "You're an optimist." And you know what? He's right. I am an optimist. I want to believe the system can be fixed. I want to believe people will do the right thing if given enough information. But after seeing this on Tuesday and coming on the heels of Davidson Commissioners' inaction last week regarding the Travis-Woods visit to Senator Berger's office to lobby for the project, that optimism that people will do the right thing has finally been shaken. The last benefit of the doubt has been given. The last second chance has been granted. It is time to set a new course. 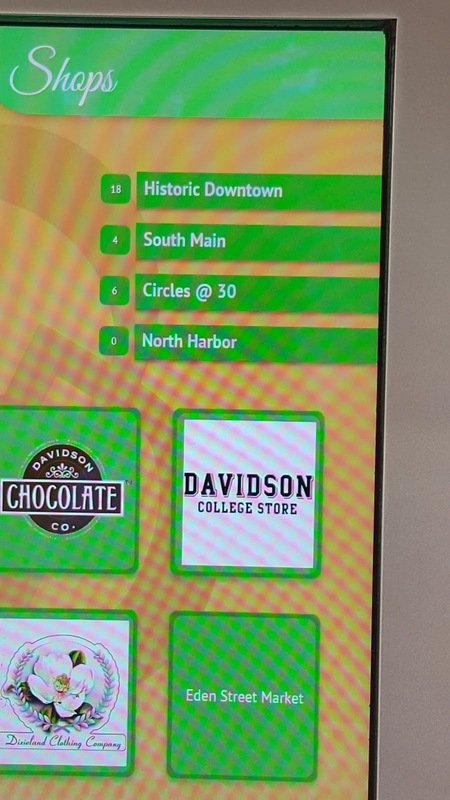 Davidson about to get its first real taste of "Urbanism"
Davidson planning types have long fancied themselves as followers of New Urbanist doctrine. It's the driver behind the Catalyst Project's initial design, and it permeates the planning ordinance signed last year. 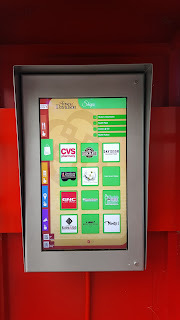 Well, the town is on the cusp of seeing how that will really work at scale. The new apartment building at Circles@30 is almost done and The Linden is starting the hunt for residents. There was even a booth at the Farmers Market this past Saturday. Here's how The Linden website describes the project. The Linden is Davidson’s BRAND NEW urban apartment community opening August 2016. Located within walking/biking distance to Lake Norman, the historic downtown area and Davidson College. 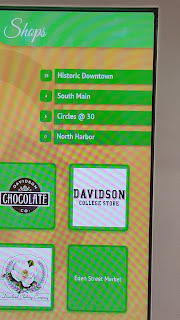 Harris Teeter, Dunkin Donuts, and a variety of restaurants and shops are located directly across the street! If convenient access to Interstate 77 is important, we are less than a mile away. Large employers such as Ingersoll Rand (1.3 miles) and Lowe’s Corporate Headquarters (7.6 miles) are very close by! The Linden offers 162 studio, one and two bedroom apartment homes, retail businesses on the ground level, controlled security access, full fitness center, relaxing pool, clubroom, books nooks, pet salon, courtyard with grills, fire pit, and plenty of bike and interior storage space. Apartment homes will feature stainless steel appliances, granite countertops, walk-in closets, oversized windows and large balconies. We are pet friendly and smoke-free! Come experience Davidson’s great sense of community in this pedestrian and bike-friendly town that believes in sustainable space and being distinct in its qualities." What is interesting is that as Davidson promotes an urban lifestyle, at the last Board meeting Commissioners refused to let construction start an hour earlier on Saturdays (at 8am instead of 9am) for the remainder of the project. It was an exception to the town noise ordinance. Plus neighbors had complained." That seemed a bit ironic though for the board to turn down something that just amounts to "urban" noise. When a couple hundred more people and all their cars get there, what will the Board do about that? We will soon find out. A crack in the "Catalyst Project" dike? 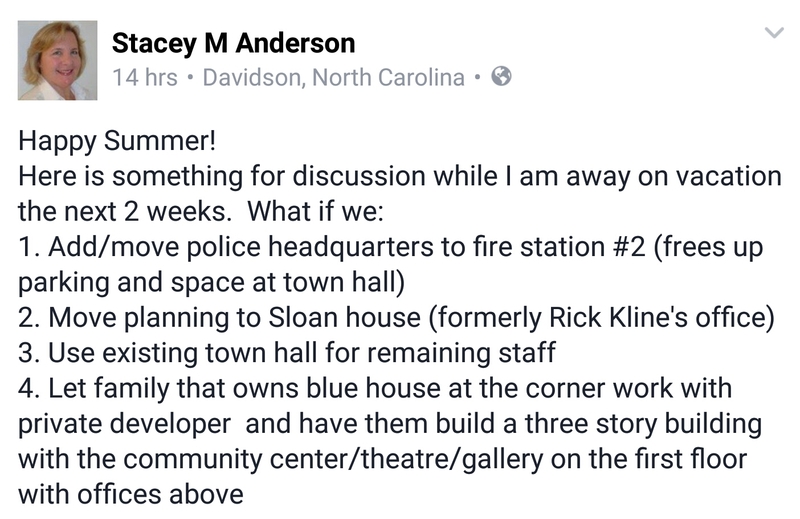 Monday morning Davidson Commissioner Stacey Anderson asked to join the Paradise Lost Facebook group. That's the group of citizens leading the charge against the controversial Catalyst Project to develop land around the current Town Hall. She immediately posted this proposal. For reference, Fire Station #2 is in the design phase and will be located on town owned property next to the Beaver Dam House on Davidson-Concord Road. At first glance this seems like the most reasonable idea thrown out to date. It makes good use of existing town resources. It gets the town out of the development business as part of this project. It also could be done in manageable phases. Certainly there would be costs to this proposal like any of the others, but those could be managed in smaller chunks. 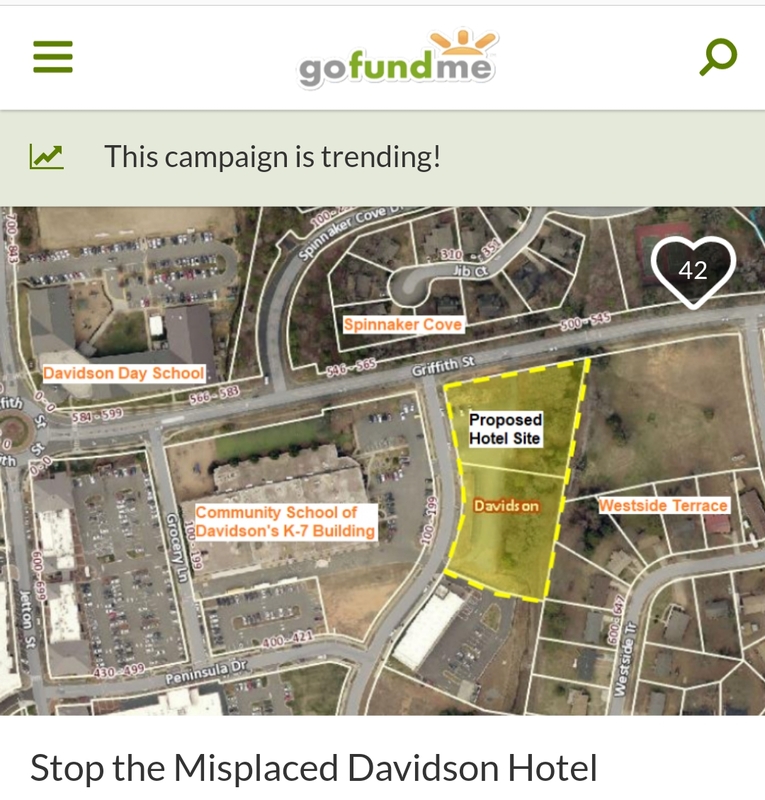 Back in February, aShortChronicle broke the story about a possible new hotel at Exit 30 on the land next to Woodies Auto and across from the Community School of Davidson. In recent weeks rumors began swirling again about the project. 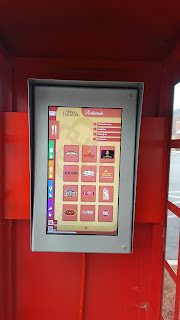 While an official development application has not been posted on the town website, more information has been discovered in recent days. 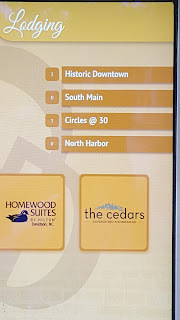 In documenation provided by the town, it shows as recently as early April, developers were "contemplating a Hyatt Place hotel with full service roof top restaurant; likely five stories." There was some question about whether or not the rooftop restaurant effectively made the building 6 stories, but the answer to that is unclear. What is clear is that the initially discussed height of the building was well over 60 feet which would make it the tallest building in the immediate area. IF the project does turn out to be a Hyatt Place, here is what one can expect based on information from the Hyatt Place brand guidelines website description. 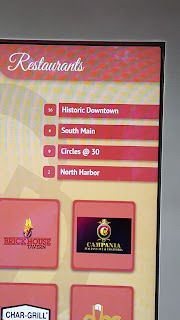 "Created for multi-blenders with 24/7 lifestyles seeking an upscale select-service hotel, Hyatt Place is a new generation of hotels offering casual hospitality in a smartly designed, high-tech and modern environment." The site goes on to say the hotels are typically 125-200 rooms and six stories. In attempting to confirm more details aShortChronicle recently reached out to the developer, the hotel partner, and the town. Developer Martin Kerr, said when asked about the number of rooms that it "generally" stuck to the number in a February press release. That number was 120. 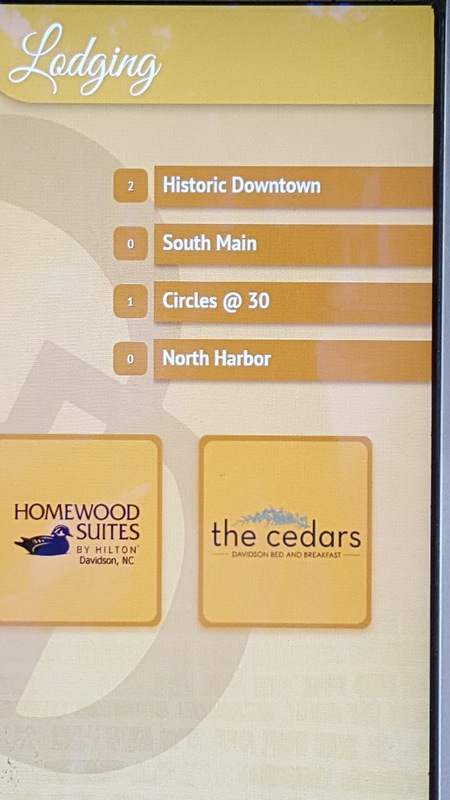 If that's turns out to be true, that would put this hotel on the low end of the Hyatt Place range. Finally, Davidson Planning Director Jason Burdette said this about the project. After qualifying that the town has a standard process for projects he said, "some of these projects continue, some do not. Those that do continue usually go through significant change before an application for development is officially submitted." In a followup question Burdette did say if this project goes forward this plan would be "conditional" - meaning the Town Board would have to approve it. Keep your eyes on this one. It is sure to get interesting. Moving at what can only be described as lightning fast speed for a large government agency, NCDOT workers posted lower speeds along the length of Davidson-Concord Road on Thursday. This comes just two days after the Board meeting described in the previous post where residents implored the agency to not wait and tie the lower speed to the West Branch development. At the Tuesday meeting after the public hearing there was a rapid fire discussion with multiple points discussed about enforcement, the technicalities of how speed limits are set, and even an arcane discussion of the "default" speed limits for municipalities involving exactly which parcels of land along the road are (and are not) within the town limits. In the end though it boiled down to this. The town sent the below letter. The letter asks for speed limits according to the below map. And NCDOT made the changes. When asked to explain the change in approving the 35mph starting at the Beaver Dam House heading into town, NCDOT Engineer Scott Cole had this to say. "We approved the speed limit reduction to 45mph and to 35mph prior to the meeting, but we're really discussing the details of the timing of the reduction. We had proposed reducing the speed limits as the proposed development was to come on line. The Town Commissioners and therefore the Town proposed and expressed through their resolution, that they wanted the reduction to 35mph to occur immediately. We respected the Town's wishes on timing and moved to implement immediately. The signs should be in place at this time." And that they are, for which many in town are very thankful. Drivers should also know that at the meeting Chief Miller said "35 means 35! ", so don't say you weren't warned! #DavidsonConcordSpeedway - Citizen pressure works to get the right things done. The first major topic at Tuesday night's marathon Davidson Board meeting was an update from NCDOT on safety improvements. The update from Division 10 Engineer Scott Cole began with informing the town that the crossing signals in downtown David son were being set to use a 3 second LPI or Leading Pedestrian Interval to allow pedestrians to cross before cars get a green light. This change comes after the tragedy on Main Street where local resident Janet McFadden was struck and killed in the crosswalk by Flatiron restaurant. An LPI of 3 seconds, should reduce accidents by 60% and reduce the severity of any that do occur according to Cole. The obvious question of why not make it 5 or 6 seconds to make it even safer was not made clear. However, this is definitely an improvement and one that was to go into effect immediately. In fact NCDOT workers could be seen working on the lights at almost 10pm Tuesday night. But the real show on pedestrian safety had to do with the Davidson-Concord Speedway. We told you about the press release last Friday where NCDOT planned to lower the speed on "the DCS" to 45 for the whole length of the road. We also told you that did not address the most dangerous part of the road for pedestrians. We told you local residents would not be happy about that, or safety improvements being tied to Commissioner Brian Jenest's development at West Branch. During the public comment section a parade of people came up to implore NCDOT to lower the speed limit and to lower it now! Starting with Don and Jennifer Stewart whose son was hit at the Robert Walker intersection three years ago and running through more several speakers, one after another residents recounted stories of near misses, increasing traffic, and anecdotes proving why lower speed will work to make it safer. One speaker roped in Police Chief Jeanne Miller who was in attendance. Chief Miller agreed with the residents that she wanted it to be 35 on that road. Another speaker recounted how he had just returned from New York City where the city has made the entire city 25mph if you are not on a highway. The change wasn't phased in over time apparently. It was done to save lives and pedestrian fatalities are down significantly. But the highlight was resident Jana Watt who has been one of the citizen leaders in the recent push to get this situation fixed. 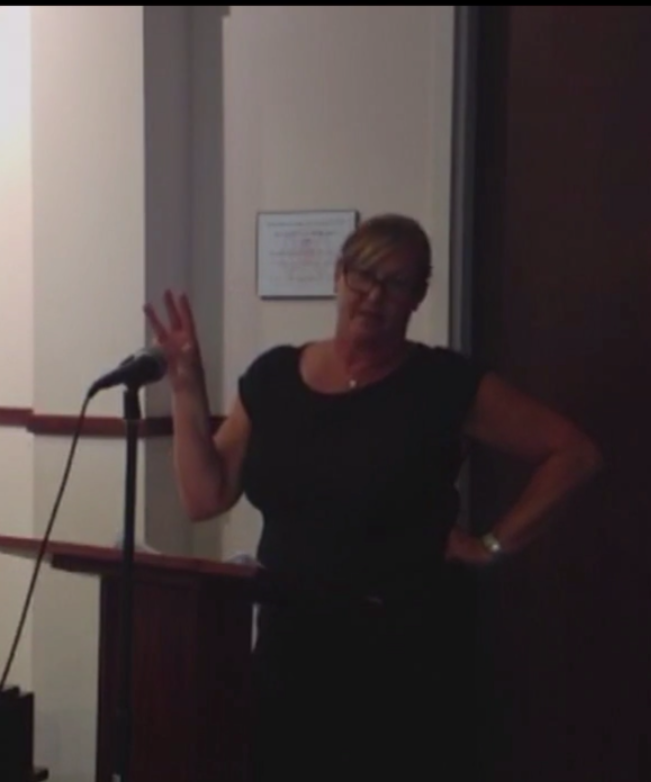 Watt gave one of the best citizen presentations at a public forum you will ever see. You are strongly urged to watch this video. Its about 9 minutes. Watt dismantled pretty much any and all arguments for not lowering the speed limit in the pedestrian area now. She raised lots of questions about who is representing who between the town, developers, and NCDOT when it comes to development. She repeatedly mentioned public records requests. It was brutal and it was beautiful to watch at the same time. When the public hearing was over, the tide had turned. After a few questions from Commissioners and in what genuinely seemed like a surprise move to the Board, Cole agreed to lowering the speed with increased enforcement from the town. The timing and exact details of the change are still being verified. Check back for another post on that hopefully by the end of the week. Others deserve credit for this change as well. Rep John Bradford and Davidson Mayor Pro Tem Beth Cashion in particular. Well, Tuesday night in Cornelius and Davidson came and went with both Mayors still standing. In Cornelius, as expected the Board unanimously passed a vote of no confidence in Mayor Chuck Travis - a vote he summarily ignored and one where he defiantly stated he would not resign. The meeting was over in minutes. Where the Board goes from here is hard to know. What do you do with a sitting mayor who could not possibly have a working relationship with his Board, and it's over 16 months until election day? In Davidson as was said earlier, the situation was "fluid". That fluid turned out to be something like really watered down coffee that does absolutely nothing but leave a bad taste in your mouth. For going to Raleigh and advocating a position contrary to the Board's position, Davidson Commissioners did nothing to Mayor Woods. Not a reprimand, not an official censure, not a no confidence vote. Nothing! Instead, they just passed a resolution reaffirming their position against the project and contract. Oh, wait...no, they did do something to Mayor Woods. They took the harsh action of not letting Woods sign the resolution they passed. The Board will sign it instead. Commissioners Cashion, Fuller and Jenest plan to deliver that new resolution in a Raleigh press conference organized by Senator Jeff Tarte on Wednesday. During the comments on the subject of the Mayor's visit commissioners danced around the subject and repeatedly said they were "disappointed". Only Commissioner Graham gave a detailed reason for the Board taking no official action against Woods. Graham spoke about 5 Commissioners not overriding the vote of the people that elected Woods. That's a position that could actually be respected if a vote of no confidence and seeking a resignation was the only option. It wasn't. The Board could have issued a censure of Woods. They didn't. Not being willing to go even that far considering what Woods did to undermine the Board simply invites more of the same. Also during the commissioner comments, Commissioner Brian Jenest spoke about "trust" and how officials have to be careful not to damage it. Ironically, the lack of action by the Board greatly damaged public trust. That is a certainty. In fact, it may have done as much damage to that trust as Woods's initial actions did. And that may be the saddest part of all. Here is the no confidence resolution the Cornelius Board will vote on tonight. Today stands to be one of the most interesting days in the history of North Mecklenburg politics. Last week, we reported on the ill thought out trip by local Mayors John Woods and Chuck Travis of Davidson and Cornelius to see Senate leader Phil Berger. The purpose of their trip was to advocate for the I77 HOT lanes in contradiction to the official position of their respective Boards. In both cases the men claimed to only be expressing their personal opinions and not those of their respective towns. The public response has been swift, vicious, and very likely fatal to both of their political legacies. Almost immediately reports began swirling that Cornelius would seek to oust Mayor Travis. That Board had already censured his previouy for his off script actions on opposition to the town's official position. Then on Monday, CorneliusToday.com posted a detailed story about what's likely to happen to Travis. He will very likely will receive a vote of no confidence and then be asked to resign at a special merting called for Tuesday. Over in Davidson, the situation is more fluid. Davidson Commissioners have been tight lipped about what may happen to Mayor Woods. Will he receive a censure? Will he receive the same treatment as Travis? Nobody is saying for sure. However, one citizen posted responses from several Commissioners on Facebook to those questions. The response was that the Board had met with Woods regarding the Raleigh meeting and that they were "disappointed" in his response. It would seem unlikely that the Davidson Board would do nothing. An agenda item for the I77 Managed Lanes project has been added for tonight. If no official action or very weak action is taken, the public would see that as the Board being complicit in what Woods did. They certainly do not want that as it would turn the public’s ire on them. How all of this plays out is sure to be a spectacle, and it could have far ranging impacts. Any political cover Senator Phil Berger was hoping to get from last week's meeting will have been stripped away. Berger was clearly hoping to hold up these two renegade mayors as the reason for his holding up the bill to cancel the toll project. If both of those mayors receive serious punishment, that plan will have fully backfired. If you've been planning on attending a Davidson Town Board meeting but haven't gotten around to it, this Tuesday promises to be a good one. Multiple high profile items are on the agenda. At the beginning of the meeting, the town will hear from Scott Cole with the NCDOT. As reported on Saturday, the NCDOT sent a press release on Friday announcing a plan to reduce speed on the "Davidson-Concord Speedway", but the announced plan does not immediately address the most dangerous aspects for pedestrians. Last month citizens packed Town Hall and the plan likely won't satisfy parents concerned about the dangerous crosswalks at Robert-Walker and Appollinaire. The town has also added a discussion titles "I77 Managed Lanes". After last week's disastrous revelation that Mayor John Woods secretly went to Raleigh to support the project, this will definitely be newsworthy. Woods was accompanied on that trip by Cornelius Mayor Chuck Travis. It is being reported that the Cornelius Board is considering a vote of no confidence in Travis and possibly even asking for his resignation. Woods claims he was not speaking in behalf of the Davidson Board when in Raleigh. That's in spite of the fact the meeting occurred on Town Day at the NCGA when electeds from all over the state were there to represent their towns. The post on Woods's response has rocketed to the #6 most read piece here at aShortChronicle. There is definite interest in this one. Will Davidson Commissioners do anything to Woods, or will they let him skate? Oh yeah, and the Town will pass next year's budget. The meeting starts Tueaday at 6pm. Bonus Observation: There is also one item on the agenda that would normally be a formality. The removal of the commercial section from Summers Walk is set to be approved. Commissioner Brian Jenest's firm firm is doing the work. Will he ask to be recused? He should. But, will he? Three weeks ago, NCDOT State Engineer, Kevin Lacy, with the Transportation Mobility and Safety Division travelled to Davidson. He spent a Sunday afternoon and the better part of Monday looking at the situation along Davidson-Concord Road, meeting with residents, and discussing the local officials. This was the trip we reported on immediately after the May Town Board meeting. Rep John Bradford deserves the credit for making this trip happen from speaking with those familiar with its details. It appears getting state legislators involved was the correct path all along over these many years to get this issue moving. Leaving citizens to wonder why the Town had not done that previously. 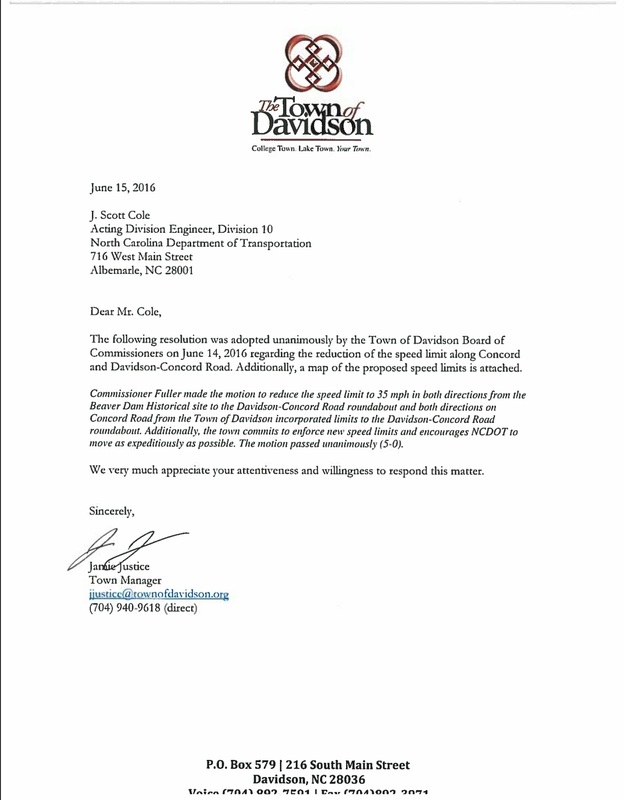 Yesterday afternoon, NCDOT issued a press release outlining plans to reduce the speed on Davidson-Concord Road. That sounds like great news. 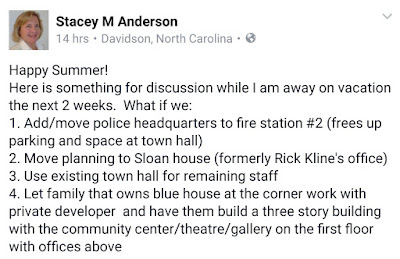 That sounds like it should appease local residents who packed Davidson Town Hall last month. Right??? Unfortunately, the "devil is in the details" and that's particularly true for the most dangerous section of the road for pedestrians. 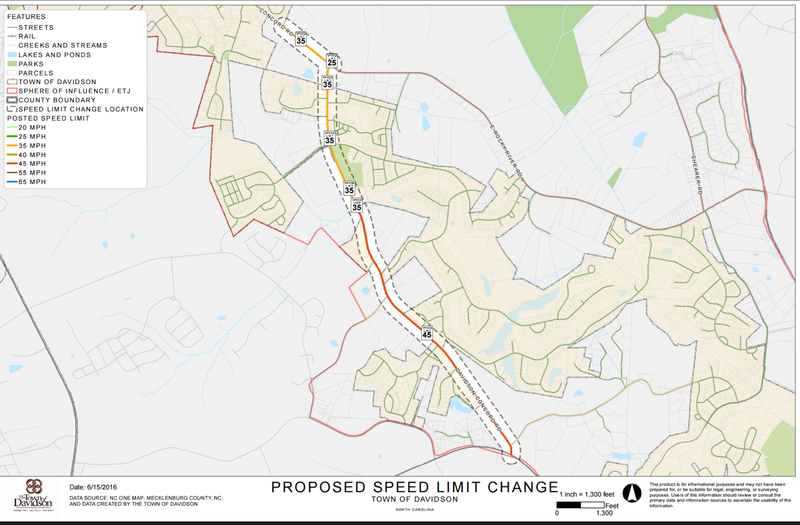 CHARLOTTE – The N.C. Department of Transportation is reducing the speed limit from 55 mph to 45 mph along a portion of Davidson-Concord Road in Davidson. After further review, the NCDOT determined that 45 mph is a safe and reasonable speed along Davidson-Concord road from south of Robert Walker Drive to N.C. 73. NCDOT crews will change the speed limit signs in that area on Thursday, June 16. The new speed limit becomes effective once the updated signs are installed. 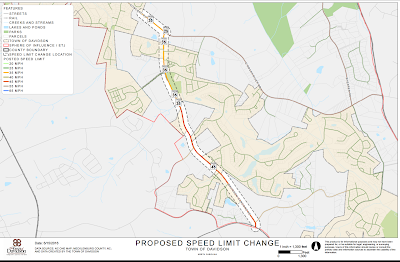 The Department is also planning a future reduction of the speed limit from 45 mph to 35 mph along Davidson-Concord Road from south of Robert Walker Drive to the roundabout. The speed limit change will be implemented once the new residential development in that area is 25 percent occupied. On-street parking along this section of Davidson-Concord Road will be implemented with the commercial aspects of the development. Readers will remember that the current swirl around the speeds on this road came up when aShortChronicle published the traumatizing videos in this piece back in April. Those videos were taken in the area which will not have the speed lowered immediately. The plan presented in this press release leaves those children crossing the street at the exact same risk they are today - potentially for years. What is even more perplexing is the arbitrary selection of 25% buildout on West Branch as the magic number for improving safety. That equates to about 77 houses. Yes, adding 77 houses will make it worse, but that entirely misses the point. The intersection of Robert Walker and Davidson-Concord is terribly unsafe now. The speed needs to be lowered there now. Arbitrarily waiting potentially as long as another 18 month to 2 years (maybe longer) before this is improved will very likely be seen as unacceptable to residents. It is inviting tragedy. 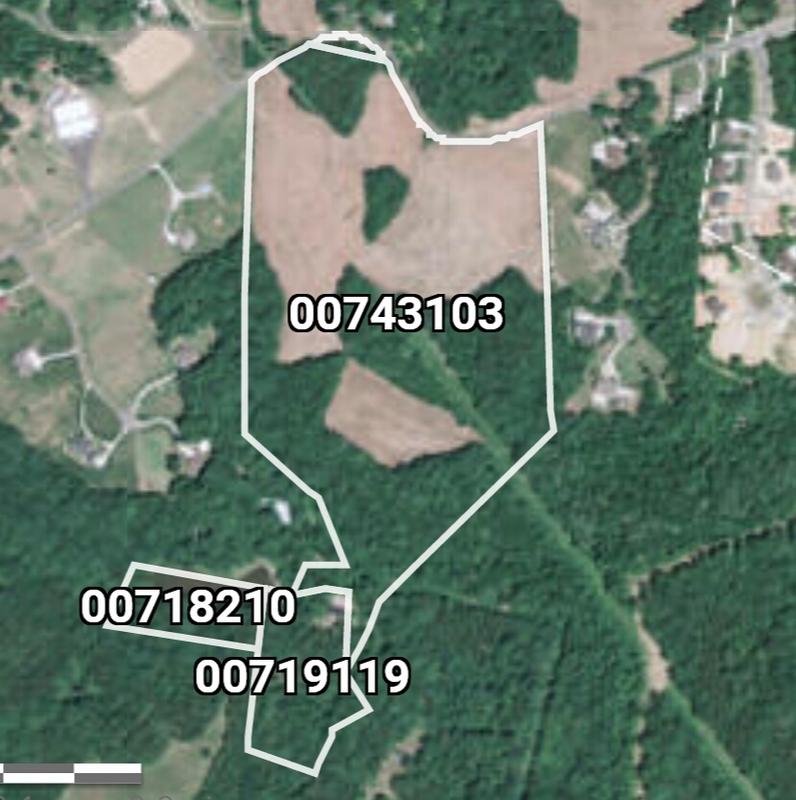 Just as disturbingly is how the town has allowed this issue to be convoluted with a development they've supported, a development involving a sitting Commissioner (Brian Jenest), and one that has received multiple special land/zoning related approvals. 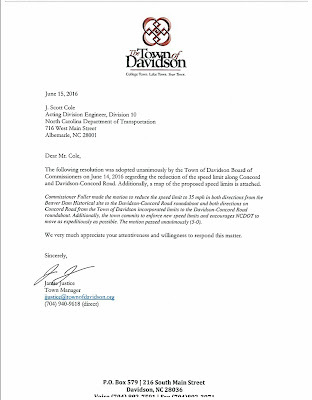 NCDOT will be at the Tuesday Board meeting at Davidson Town Hall. The public comment and presentation are at the top of the agenda. Plan on attending at 6pm. Hopefully, there is more to this plan that will be presented then to make it acceptable. Yesterday, we told you about the trip Davidson Mayor John Woods and Cornelius Mayor Chuck Travis made to Raleigh on Wednesday to speak with Senate President Pro Tem Phil Berger on the I77 HOT lanes. Well, now Mayor Woods has finally responded. Here's what he has to say in in an noontime email response to aShortChronicle. "I went to Raleigh on June 8, 2016 and met with Senators Berger, Tarte, Curtis, and several others. At no time did I speak on behalf of the Davidson Board of Commissioners or the citizens of Davidson; I voiced my own opinions on the need to improve traffic congestion in our region." Ok. So in other words, nothing to see here. Mayor Woods was not speaking as "Mayor Woods" or for the Town Board when he went to see arguably the most powerful elected official in the Great State of North Carolina. No. He was just good ol' "John Woods" voicing his "own opinions". How about you or I try to get a meeting with that group of officials? Do you think we'd even get the time of day if it was just to give our "opinions". To say this is not a credible response from Mayor Woods is being generous. Davidson's Board should not, must not, accept it. You can be sure citizens won't. Ambush of Anti-Toll efforts on #NCGA Town Day - AGAIN! That post, titled "HOT Lanes: The Empire Strikes Back", was the first post on the site to get what could be called a significant number of page views in a single day. It hit a nerve. It exposed the kind of behaviour individuals within government were capable of stooping to in order to pursue their dream of HOT lanes. It was the first of many posts that would continually expose that fact. Yesterday, that type of ambush happened again. Late Wednesday/early Thursday word began leaking out of something hard to believe. Mayor Woods and Mayor Travis traveled to Raleigh on Wednesday during this year's Town Day event and met with Senate President Phil Berger to strongly advocate for the HOT lanes project. They did so behind the backs of their respective Boards. They did so against the will of their constituents. They did so when they knew it would hurt the most. This level of betrayal of the public trust when clearly an overwhelming majority of the public opposes the HOT lanes project is shocking. It is hard to believe. Even after all the underhanded and dishonest actions by the pro-tollers over many years, this one earns these elected officials a special place in the hall of fame for bad faith actors. Benedict Arnold has nothing on these two. 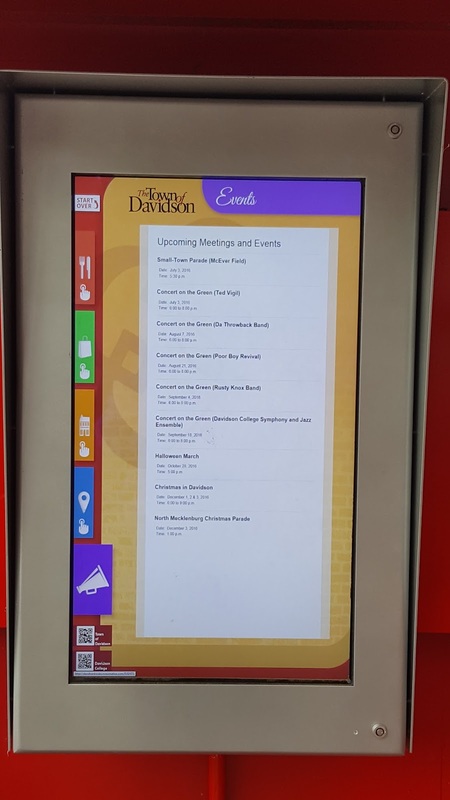 In a conversation with Davidson Mayor Pro Tem, Beth Cashion, it was confirmed that none of the Davidson Board was made aware of the meeting prior to its occurrence or that Mayor Woods would attend. In fact the plan was that Davidson was not sending anyone to Town Day this year. Cashion went on to say that based on what is being communicated by those who were in the room, Mayor Woods was not accurately representing the position of the Board or the Town of Davidson. In other words Mayor Woods was spreading "misinformation". Woods loves to accuse people of spending so called misinformation. It's his polite way of calling people liars when he disagrees with them. See here for more on that. Today, it looks like he was engaging in spreading misinformation himself at the expense of those he supposedly represents. As the dust settles on this one, Davidson's Board will need to decide what to do with the Mayor. If he misrepresented their wishes to one of the highest officials in the state, there must be consequences. Woods has not returned multiple requests for comment from aShortChronicle and as of earlier today he supposedly was not returning calls from Commissioners either. The town Public Information Officer also says he is unavailable. The cone of silence has descended. If mayor Woods or the town responds, there will be an update. The Town of Davidson has a lot on its financial decision making plate these days. There’s the ongoing saga around the controversial Catalyst Project to develop the town owned downtown property. The second batch of so called “roundtable” discussions are currently underway to gather input from the public and attempt to make the sale on what has become an increasingly publicly funded idea. The town is set to pass its next budget which includes an over 6% spending increase in the town’s general fund. While the town is proposing to keep the tax rate steady, it is spending every dime of extra revenue that has started to come in as the local economy improves. The town also plans to start the long overdue second fire station to serve Davidson’s east side. That project looks to take a big chunk out of the town fund balance (aka its savings account). Then of course you have Mi-Connection – the town owned cable company. While that situation continues to improve, the town is still looking at a $1 million subsidy payment this year with subsidies likely to continue for at least a couple more budget cycles. 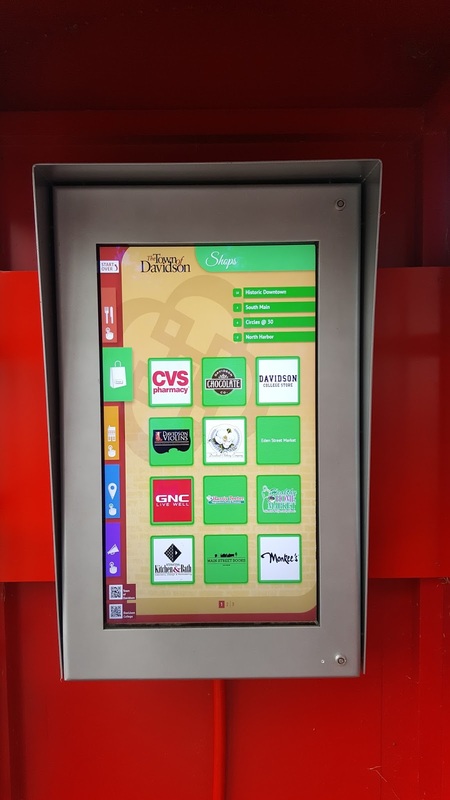 Finally, you have the issues currently swirling around private sector development projects such as the large West Branch neighborhood on Davidson-Concord Road and the possibility of a new hotel at Exit 30. These new projects bring with them new costs as well as new revenue streams with the realities of how much of either still quite murky. On top of all these financial variables, the town has also been looking at the possibility of pursuing its first ever general obligation bond, or “GO” bond for short. Earlier this year the topic was the subject of multiple meetings surrounding the town’s long term capital projects list. Besides the fact that this debt requires voter approval, what makes GO bonds different from other forms of debt financing is that they are backed by the “full faith and credit” of the government entity issuing them. Meaning the government commits raising taxes as necessary to pay off the debt. In that sense, much like the authority conferred on the famed 007 in the James Bond movies. GO bonds provide a “license to kill” when it comes to raising taxes. In fact it “obligates” the town to raise taxes as needed to pay off bond debt. With Davidson already having the highest municipal tax rate in North Mecklenburg, already having a number of significant projects on its plate, and already spending every dime of increasing revenues in its next proposed budget, the town should postpone any decision on a bond referendum for later this year. Taking another year to see how the above issues shake out will likely provide a good deal more clarity to the town’s future financial situation and its true overall capital needs. Besides, with many decisions yet to be made towards a well thought out bond proposal, it’s far from clear the town could pull together an appealing proposal in time for something this year. The town’s own bond counsel from the Parker Poe law firm informed the town in April that the process really needed to get formally underway in June to prepare for a November referendum. Commissioners need to be very cautious in how they proceed if they want a bond proposal to be successful - whether it’s now or in the future. A bond proposal that does not serve the entire town may not pass. A bond proposal favoring pet projects of Town Hall may not end favorably either. Proceeding deliberately with a significant amount of public input on any proposed project list will be the best way to ensure success. If the town wants that “license” from its citizens, it still has work to do on both counts. 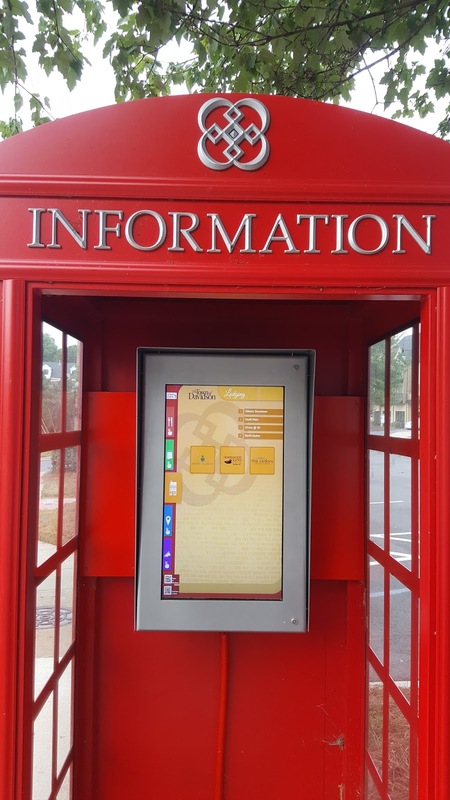 We've tried here recently at aShortChronicle to give the Town of Davidson credit for improved transparency. To those at Town Hall, really, we have. I promise. But something happened at Monday's "special meeting" which really shows there is a looooong way to go. The meeting was "special" because the date had to be changed from the typical "1st Tuesday" meeting which occurs every month. There was also a 2 hour presentation about the town's proposed new Rural Area Plan. At the end however, there was supposed to be a discussion on multiple other items - including the town possibly joining a new incarnation of the LNTC - the subject of the last post. Inexplicably, the video of the meeting is summarily cut off just as that discussion was about to begin. Watch the last 50 seconds below. The video camera has been moved into place, clearly with the intent of filming the remainder of the meeting. Mayor Woods asks if the video is still on. He shakes his head. Then, boom. The video goes off. And this is not the first time these "1st Tuesday" meetings have been less than transparent. The Herald Weekly had a not so flattering story about them just a few weeks ago. In that story Commissioner Brian Jenest called into one of the "1st Tuesday" meetings. 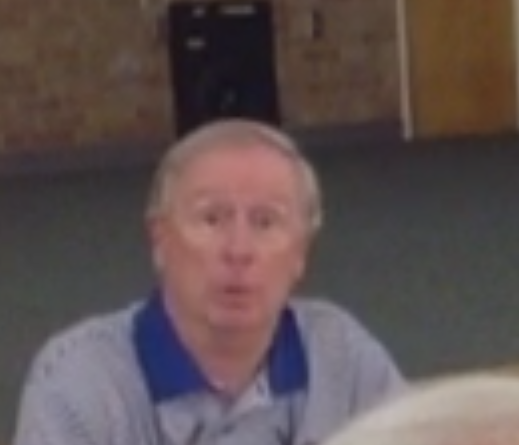 He was going to relay information he had about a meeting with NCDOT, but upon hearing a Herald reporter was in the room he declined to discuss it. In the past Davidson briefly held an informal monthly meeting inside Commissioners homes. While these too were technically open to the public, few if any people ever attended. Thankfully, the town got rid of those. Nobody believed they were just for "team building" anyway. Those meetings were replaced by this "1st Tuesday" gathering. There was not supposed to be a formal agenda, and the idea was that they would be more transparent by being held in a more open forum. As these two examples show, that idea of more transparency only goes so far. Update: Commissioner Cashion just contacted me to clarify one point. The date of this particular meeting was moved at her request because of conflicting graduation events, not to obscure any of the items on the agenda. While the date move is not the main point of this post, we're glad to clarify that in case readers got that impression. The LNTC is dead! Long live the LNTC!!! We've reported previously on the demise of the Lake Norman Transportation Commission. 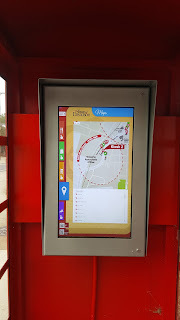 See here and here. 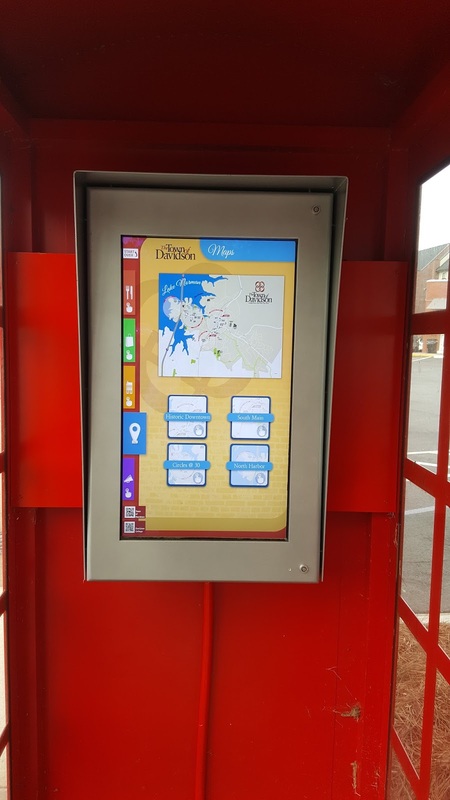 The transportation group funded by Davidson, Cornelius, Huntersville, and Mooresville was incarnated to help represent the local towns and their collective interests when it comes to transportation issues. Since 2008 the body has had what can best be described a a mixed bag of results. At best, it has given the area a seat at the table when it comes to local transportation discussions. However, that seat comes with no real authority and when facing the largest issues impacting the towns the body has been ineffective. Think of the failures surrounding the Red Line Regional Rail and I77 HOT Lanes projects as examples. To that end Huntersville decided to pull out of the body earlier this year to pursue a less formal and less expensive approach. Cornelius and Davidson soon followed suit to avoid getting stuck with a larger portion of the bill. Almost all of the body's funding goes to pay the executive director's salary - over $80,000 per year. aShortChronicle obtained a copy of the Draft MOU for a new Interlocal Agreement. Here is the gist of it. Davidson is apparently looking to join a reconstituted LNTC made up of Davidson, Mooresville, Troutman, Statesville, and Iredell County. Town Public Information Officer, Christina Shaul, provided a few wordsmithing comments made by Commissioners on the below document. However, none of them change the fact that the town is considering joining a body it just left and that it appears it will be the only Mecklenburg entity in what will be an Iredell County heavy organization. Mayor Woods and Commissioner Jenest pushed hard for Davidson to remain in the LNTC even as Huntersville and Cornelius left the old organization. It appears they may have gotten their way if this goes forward. What most disappointing about the below proposal is that it seems to have many of the same issues as the old body. It makes recommendations, but they aren't binding. Thus it seems hard to imagine it will have any more impact on large decisions than the old LNTC. 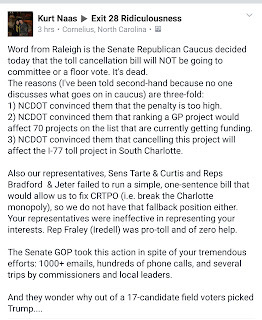 Contact your #NCGA Senators - Help stop I77 tolls! Last week, the effort to cancel the 50 year contract and stop the I77 HOT lanes project achieved the unthinkable. HB954 passed the NC House by a vote of 81-27. As you can see, the vote was overwhelmingly bi-partisan with support across the state. 8 of 12 Mecklenburg County representatives supported the bill with one being absent during last Thursday's vote. Now comes the hard part - the NC Senate. For various reasons the Senate seems significantly less keen on the idea of cancelling the contract. The bill is sitting in the Senate Transportation Committee, but if it stays there it will be dead by the end of the month. aShortChronicle was started in large part to encourage citizen activism. This moment may be the most important one since the site's inception. Please take this moment to send a brief message to the below list of NC Senators. Ask them to support HB954. Mention HB954 in the subject line. Be polite and be brief. This is as close as this effort has ever been to stopping this project. Help make that happen! It's time to vote - again. We are about to witness one of the stranger elections in recent memory. No, not the one with the blowhard billionaire, the democratic socialist, or the former Secretary of State being investigated by the FBI. No, not that one. Instead it’s the rescheduled primaries for North Carolina’s delegation to the United States Congress. You may be asking yourself “didn’t we just have the primaries?” The answer to that questions is “yes” – with a caveat. We did just have our primary elections for all the races except for the ones for the US Congress. With the national controversy around North Carolina’s HB2 sucking up all the political oxygen recently, readers may have forgotten the previous political crisis du jour. That was back in February when Federal Courts invalidated two North Carolina Congressional districts as illegal racial gerrymanders. A three judge panel said NC-1 and NC-12 inappropriately used race to influence the drawing of these districts using a strategy called “packing” whereby these districts were drawn in such a way at to include as many minority voters as possible and thus making it easier for Republicans to win more of the other districts. Forced to quickly redraw the districts, the General Assembly did something unexpected. Rather than just tweak districts to appease the courts, they redrew all 13 districts – many of them in fairly radical fashion. While the new districts are almost as controversial as the old ones due to their partisan breakdown, they will be used in the upcoming election. No area of the state has been more impacted by these redrawn districts than the Lake Norman region. Prior to redrawing the boundaries Lake Norman area voters in Mecklenburg and Iredell counties pretty much all fell in the 9th Congressional District represented by Rep Robert Pittenger. Under the new boundaries, North Mecklenburg now moves to the newly configured 12th District and South Iredell goes to the new 13th District. This has some major implications for voters in both areas – particularly in this election cycle. The only thing that’s guaranteed is that Rep Robert Pittenger won’t be representing the area. He decided to stay with the 9th District which now only includes the southeast portion of Mecklenburg County and runs east along the South Carolina border. North Mecklenburg voters are almost certain to see a partisan switch in their representation. Like the old gerrymandered 12th District, the new boundaries are heavily tilted towards a Democrat winning the district. The new district is entirely within Mecklenburg, the only single county district in the state. Since North Mecklenburg is heavily Republican, the Democrat candidates have not been all that visible here. The one exception may be Tricia Cotham. Cotham, the daughter of Mecklenburg County Commissioner Pat Cotham, currently serves in the state legislature. She is making s strong play for North Mecklenburg voters by opposing the I77 HOT Lanes project. Iredell County voters in the new 13th District face a different challenge at the polls. Like the old 9th District, the new 13th is heavily Republican. This district however, is a truly open race this year and has drawn a record number of candidates – 23 in all with a whopping 17 Republicans. Many of these candidates are not well known across the district which stretches from Iredell over to Gilford County. Instead they are counting on a doing well in only a small part of the district and taking advantage of a one-time only rule for this primary election. Due to the late primary, there will be no run-off even if no candidate reaches 40% of the vote. In the 13th District that could result in a Republican “winner” who barely breaks into a double digit percentage of voters. This will be a very, very low turnout election, but if here’s one good thing about that for voters it’s that it gives your vote a higher relative impact. Spend the next few days doing a little candidate research and head to the polls. Due to the partisan nature of the districts, in both cases the “real” election day for these races is June 7th, not in November. Bonus Observation: On Thursday a Federal 3 judge panel unanimously upheld the newly redrawn districts while maintaining they look like a political gerrymander. See here for that story. On Wednesday, HB954 passed the first of several major milestones on its way to becoming law. The bill, filed by Huntersville Rep Charles Jeter as soon as the session opened, would cancel the contract with Cintra to build the I77 HOT lanes. 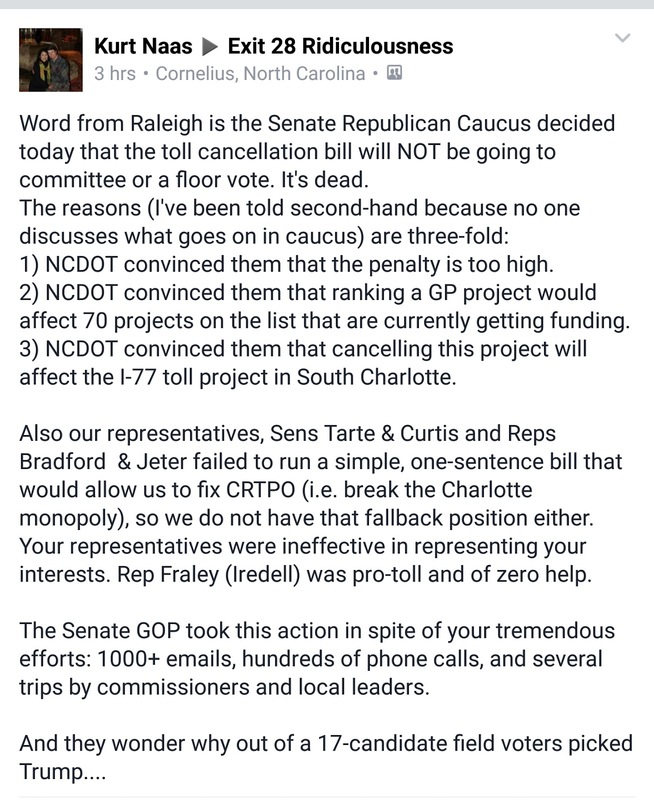 After weeks since filing, the bill was finally heard in the NC House Transportation and Appropriations Committees. In both cases the bill passed on voice votes. 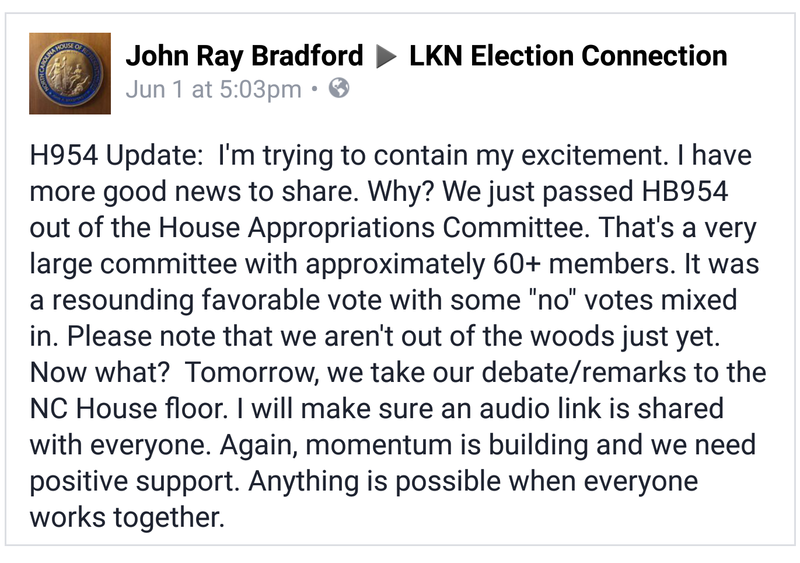 Here is what Rep John Bradford had to say after the bill passed these hurdles. The Appropriations Committee was the second committee vote of the day. 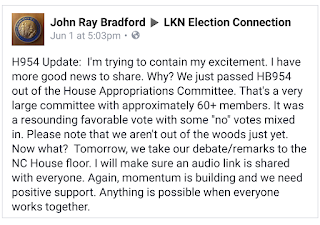 Rep Bradford's excitement is very understandable. That's because the Committee process is where unpopular or controversial bills often go to die. Committee rooms are where the political sausage is made. Amendments are proposed. Voice votes are taken. Much of the action is often not documented all that well. If a bill is going to be stabbed in the back, this is where it happens. Passing through that gauntlet intact is no small achievement and all those involved deserve the community's hearty appreciation. 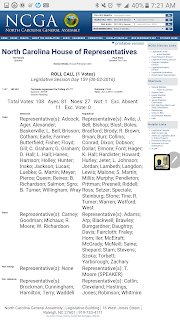 As a frame of reference, check out the stories on HB267 back in 2013. See here and here. That bill would have required a vote by the General Assembly on each toll toad project. The bill went into committee as an anti-toll effort and came out as a pro-toll bill. The legislature never had to go on record voting for this specific project. 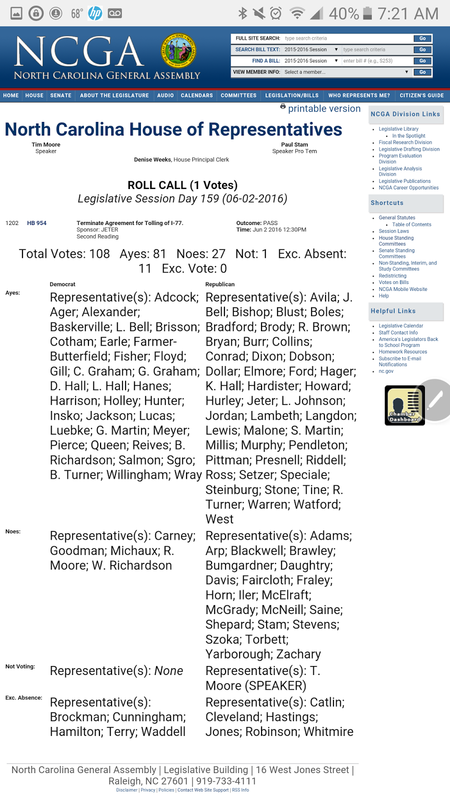 Three long years later, the first of those on-record floor votes at the NCGA for this project will happen Thursday when HB954 heads to the House floor. Correction: The original post got the days off. The bill passed committee on Wednesday, not Tuesday. It heads to the House floor on Thursday.